Located on Venice’s Grand Canal, the Peggy Guggenheim Collection is one of Europe’s premier museums devoted to modern art of the first half of the 20th century. The collection is housed in an 18th century palace called Palazzo Venier dei Leoni which was home to Peggy Guggenheim for almost 30 years. The museum now exhibits her own treasure trove of modern art including paintings and sculptures. 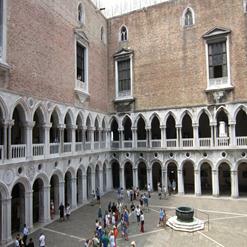 The collection has now become one of the most visited cultural attractions in Venice.